Tarkus Ferguson scored 16 points as UIC pulled away from Liberty in the CIT semifinals on Wednesday night. One victory from a championship. That’s where UIC stands following another strong road performance with dominant defense and balanced offense in a 67-51 victory over Liberty in the CollegeInsider.com tournament semifinals at the Vines Center in Lynchburg, Va.
Tarkus Ferguson scored 11 of his 16 points in the second half and Godwin Boahen added 13 points, including three 3-pointers, for the Flames (20-15), who rallied from an early seven-point deficit thanks to tenacious defense to win a program-record ninth consecutive road game. UIC will play at Northern Colorado (25-12) in Friday’s CIT championship game. The Bears of the Big Sky Conference, defeated Sam Houston State 99-80 in the other semifinal behind Andre Spight’s 40 points. It will be the Flames’ first appearance in championship game of any kind since the 2004 Horizon League title game, where UIC beat Milwaukee 65-62 to advance to the NCAA tournament. After battling back to take a 28-24 lead at halftime, Ferguson hit a 3-pointer and a jumper to ignite a 12-5 run, which was capped by Boahen’s 3-pointer for a 40-29 advantage with 14:58 remaining. Liberty, also nicknamed the Flames, pulled to within 42-37 on Lovell Cabbil’s 3-pointer with 12:23 left, but that’s when UIC turned on the afterburners. Freshman Michael Diggins answered with a cold-blooded 3 to ignite a 14-0 run, which included five points from Boahen, whose 3-pointer stretched the Flames’ lead to 56-37 with 6:20 to play. During that run, Liberty missed seven field-goal attempts and committed four turnovers. UIC led by no fewer than 14 points the rest of the way. The Flames limited Liberty to 33.3 percent shooting for the game. The Flames trailed 16-9 halfway through the first half before they finally righted the ship with stout defense, which in turn gave their offense more confidence. 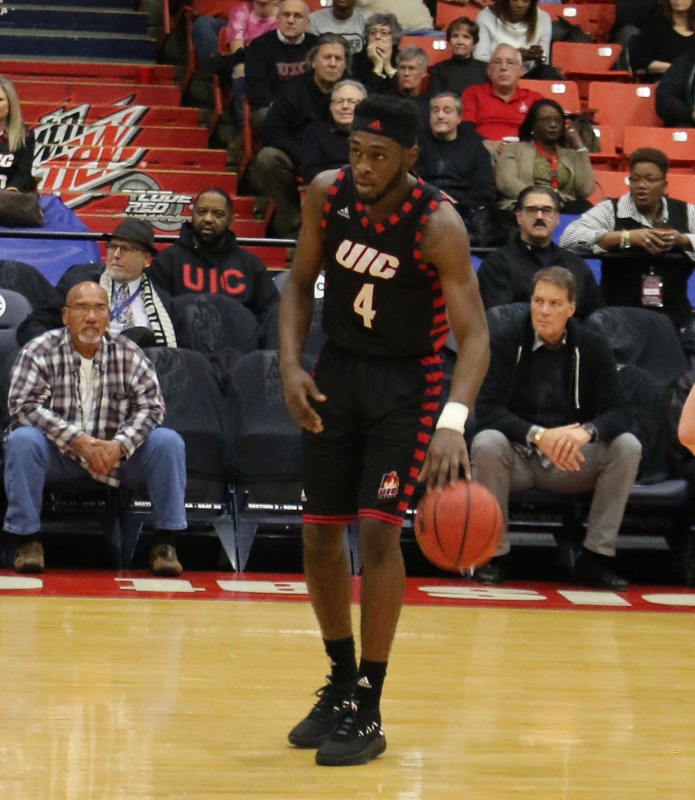 Starting forward Jordan Blount was sent to the bench after just a couple of minutes due to two offensive fouls and it took a while before UIC could adjust. One of the primary factors in the Flames’ comeback was the play of freshman forward Jacob Wiley, who scored six first-half points. Wiley’s hustle and timely offense helped UIC find a rhythm. Wiley’s 3-pointer from the corner finished a 7-0 run and tied the game at 16-16. Ferguson’s three-point play finally put UIC ahead at 23-22 with 4:06 left in the first half. Marcus Ottey, who finished with 12 points, hit a layup with 31 seconds left in the half to give the Flames a four-point lead at the break. UIC now will have a chance to cut down the nets and become one of just four men’s Division I teams to finish its season with a national postseason tournament victory and perhaps lay the foundation for bigger and better things to come. It will be Odiase’s final game in a Flames’ uniform and it could be the most special of his four years. FLAMES FLICKERS: McClain improved to 5-1 as UIC coach in national postseason play, going 3-0 in this season’s CIT after a 2-1 mark in the 2017 College Basketball Invitational (CBI). … UIC reached the 20-win mark for the first time since the 2003-04 season when the Flames were 24-8. … The Flames haven’t lost a true road game since an 86-51 loss at Northern Kentucky on Dec. 30. … Boahen has now hit at least one 3-pointer in 17 straight contests. … Senior forward Clint Robinson also had a strong performance off the bench, grabbing a team-high nine rebounds to go with a layup in 16 minutes. … For the first time all season, the Flames didn’t record a blocked shot. … UIC outrebounded Liberty 40-36. … After a bunch of early turnovers, the Flames finished with just 13 for the game. … Friday’s title game will tip at 6 p.m. and once again will be televised on CBS Sports Network.